So the other afternoon I went to Cracker Barrel for some lunch and on the way out I was compelled to look around their infamous "country store". I fumbled upon these candies and was compelled to know more. I was inexplicably drawn to the simple packaging and the treats it held. After sitting around my room for a few days, I finally gave in to the urge and opened the bag up. Below you'll see my findings along with some comments on each. Let's start things off with the best of the bunch. The black bat looked, well, relatively like an actual bat. 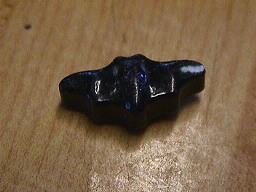 The bat candies tasted like blackberries, which was an interesting albeit satisfying choice. If we were going for realism, though, then they'd need to make the bats taste like blood, or at least iron. Next up is the iconic Halloween symbol, the pumpkin. Now, I was thinking that this was going to actually taste like pumpkin, instead it tasted like an orange! Who in the hell has ever ate an orange flavored pumpkin? I went from being baffled to becoming a little happier. 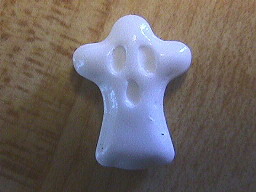 The white ghost not only is the coolest looking of the bunch, he tastes pretty good, too. On a realism scale, I'd have no idea what to base his flavor upon, maybe mold. 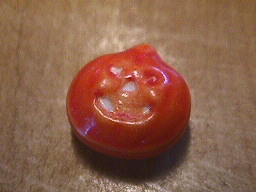 The candy itself is a mystery, with no real discernible flavor, just sort of tart. And we've saved the worst for last. This little nugget of wonder is supposed to be a moon. I can kind of see where this fits into the whole theme, but that's not the worst part. 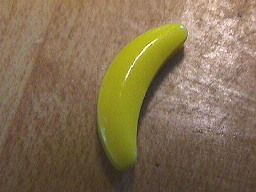 It's a banana-flavored moon! Imagine my reaction when I found out our whole solar system is based upon a phallic shaped fruit. I was pleased with my purchase in the end. All of the little blemishes didn't really deter me, and the candy itself is an improvement over the typical hard tart candy. 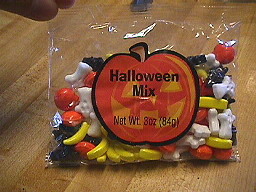 It was a Halloween Mix indeed, and I'm curious whose idea it was to market this little bag of Halloween inspired candy. Nitpicking aside, I'd give these my personal recommendation and if you do make it down to a local Cracker Barrel soon, see if you can't find a package to investigate yourself. 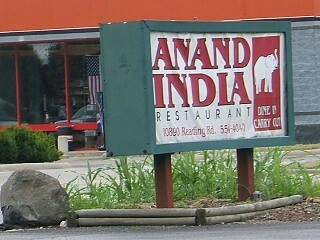 Until a few months ago, I had never even had Indian food; let alone visited Anand India. Anand sits on a stretch of Reading Rd. that’s not quite in Cincinnati, nor nearby Sharonville, either. In fact, it resides rather inconspicuously in the town of Evendale, OH. I’d passed it many times prior in my journeys, but had never went inside until recently. The outside is rather dull; giving no hints on the wealth of flavor that awaits inside, and it’s only distinguishing quality was the image of an elephant on their sign, which stirred old memories of using the character Dhalsim in Street Fighter 2. Why had I never tried Indian food? I’m not entirely sure. I’m an avid fan of food, and particularly enjoy foods of other ethnic origins, such as Italian, Mexican, Chinese, Japanese, and Greek. I never really knew what to expect with Indian, I had grown up hearing legends of curry; how it’s so hot, and that Indian cuisine is generally very spicy. I expected most of the local Indian restaurants probably had a small cadre of spices, which they’d use to heighten the flavor of their traditional and boring dishes and call it special. 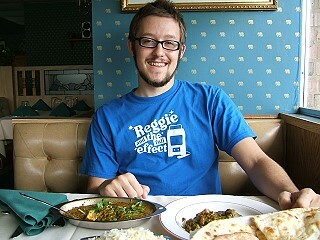 Boy, was I ever wrong… all of those art students and bicyclers downtown are right, Indian food is good! First off, we decided to go crazy and get an appetizer. On this particular evening, we opted to go totally insane, and try the Mixed Platter. This was… amazing! 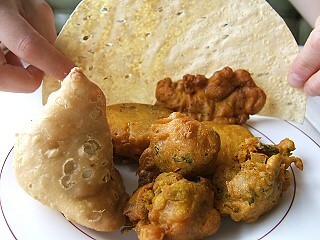 The highlight was the chicken pakora, but honestly; everything on this sampler platter was delectable. 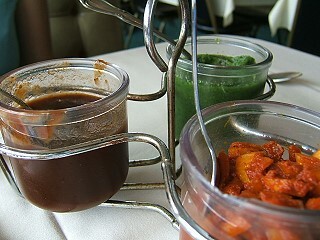 You get three sauces with appetizers generally; I prefer the dark brown variety which is a lot like BBQ sauce, and a little bit of the green variety just because it looks so weird. Let’s now talk about the entrees! Indian entrees usually come in large portions, which you then scoop out over rice and eat with your choice of Indian bread. Amanda and I usually stick to the vegetarian section of Indian menus, but occasionally we’ll stray and get a chicken dish. On this day, I had my favorite Saag Paneer; which according to their menu is described as “homemade cheese cubes cooked in spinach and cream”. 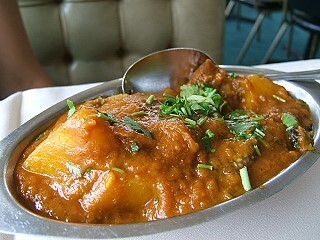 Amanda, on the other hand, had Durma Baingan; “egg plant cooked with potatoes and spices”. 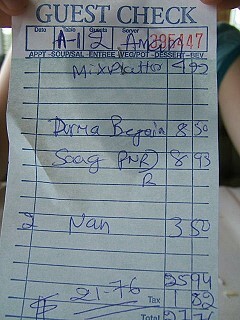 Here you can see what my meal looks like right before consumption, and the other picture is of traditional Nan. 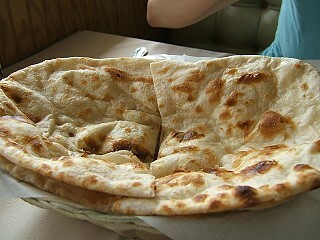 Nan is the most famous Indian bread, and comes in several varieties, including garlic, onion, mint, etc. 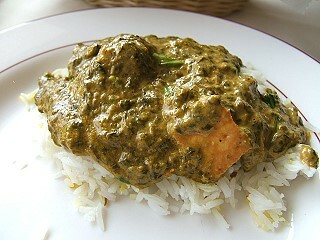 It compliments Indian food perfectly, and really completes the meal. I tend to mix my entrée with some rice, and eat it along with a bite of bread throughout the entire course of the meal. 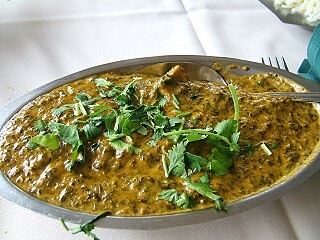 I’ve tried other Saag (spinach) dishes, including both Chicken Saag and Shrimp Saag, and have it found it to be my favorite style of Indian dish, albeit its strange look. 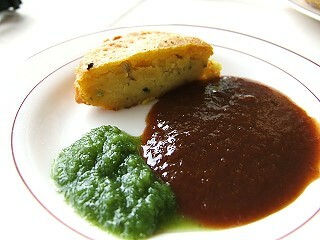 Amanda’s personal favorite is Aloo Mater, which is listed as “peas and potato combination blended with aromatic spices”. Here are a few random pictures of us enjoying our meal. 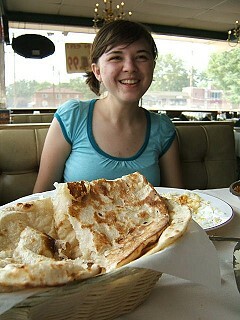 Amanda introduced me to Indian food, having discovered it while going to University of Cincinnati herself. 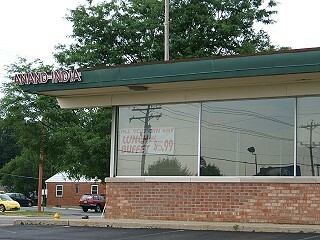 We’ve eaten at a few different Indian restaurants, but currently Anand India is my personal favorite. 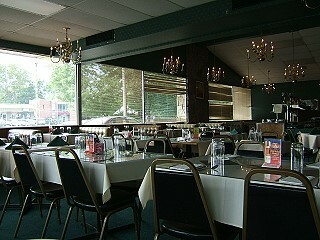 The food is always exceptional, and the staff are super nice and courteous. They’ve become to know us as regulars, and we’ve also developed a small friendship in return. In fact, the other day we went on my birthday; and as a total surprise, after our meal the staff came out with a free dessert for me and serenaded us with a terrific rendition of “Happy Birthday”. In closing, I’ll discuss a couple miscellaneous details. Most Indian places have scales of hotness in regards to their food, at Anand, the scale is 1 to 6, and I’d recommend 2. 2 will give a slightly spicy aftertaste, but doesn’t interfere with the meal’s flavors, however adding to them. In terms of drinks, you’re given complimentary water, which is often fine; but if you opt for soda, know that they don’t have a fountain, and it’ll be poured directly from a can into a glass of ice. 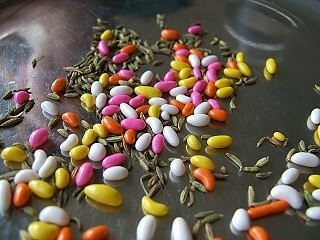 Lastly, enjoy the candy coated fennel seeds that are given for free as a snack with your bill; they’re an acquired taste, but will usually become slightly addicting. 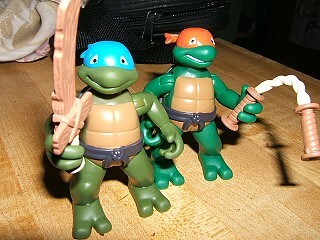 The toy gods have finally spoken, and they’ve let it be known that we’ve been a very loyal and appreciative group, and thus awarded us with what we’ve always dreamt of… baby ninja turtles! 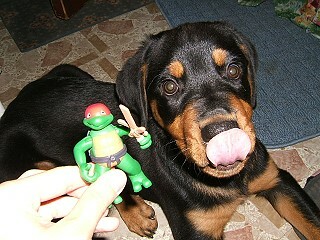 I don’t care if you ride a motorcycle and your name is Butch; these things are freaking adorable! 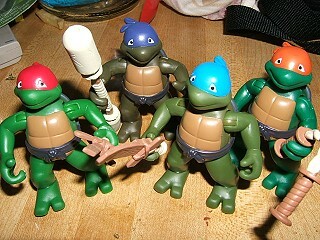 Here, our beloved turtles “are in their earliest stages of ninja training”. The back of the box points out some highlights; including eager expressions, funky full-head bandanas, and punch-absorbing way-phat baby fat. Those are the words of the marketing department, not mine! All four characters have their own unique signature weapons giving us a glimpse of what the future holds; training sai, bo staff, katana sword, and nunchaku. 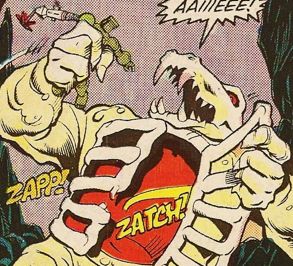 The action figures have somewhat limited mobility, the arms and legs do move, but only marginally. However, the design, both in terms of sculpture and paint is flawless. These things would make great toys for youths, or inspired desk decorations for the more adult crowed. 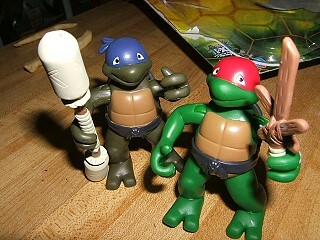 I truly like these, and think that they’re something most fellow TMNT fans will also appreciate. 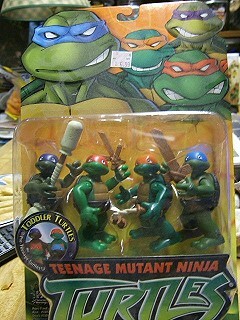 You get all four toddler turtles for the price of one standard action figure, which is swell, and you can always go back to the toy store and pick up villain Razor Fist next time… nobody else is buying him. I wanted to see how an animal would react to these; that is, if their charm would have the same effect on a canine as it did with myself. Well, judging from the accompanying pictures above… you can make your own decision. 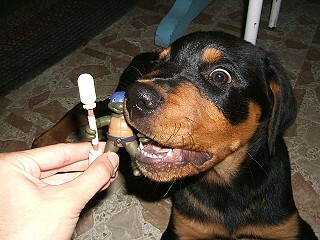 Now, if I could just get my hands on some of that mutagen stuff that bathed and chemically altered the turtles, I could create my very own radical samurai dog! 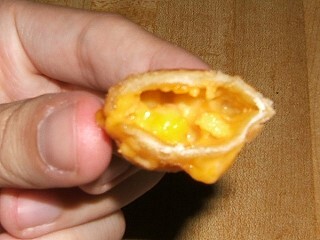 Whoever’s idea it was to invent the cheeseburger snack roll was either magnificent or masochistic. 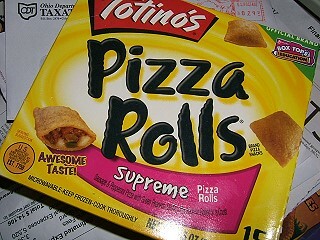 That monumental question aside, someone at Totino’s corporate is responsible for these. Ask your grandparents to tell you their cheeseburger stories and you’ll likely be whisked away to a simpler time when kids sat around on Friday nights drinking milkshakes, eating fries and burgers, and accusing each other of being communists. 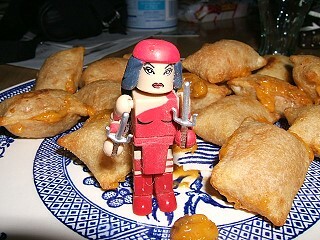 Elektra used her sais as kabobs and fed me each morsel. Out of all of the varieties I’ve recently consumed, these were the hardest to gauge on the satisfactory scale. It took me until nearly completing my meal before I had a vague decision rendered. 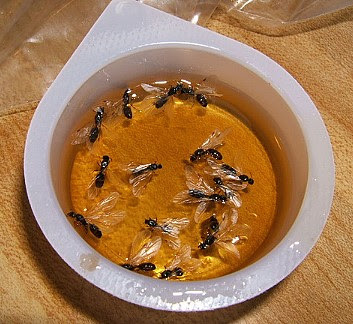 Although not uniformly bad, I couldn’t see myself dining on these too many more times in the future. 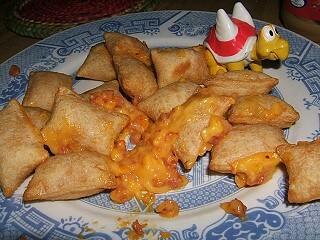 The cheese is a little too much, especially for those of the more health conscious crowd. 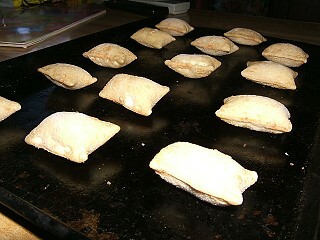 In fact, I think Totino’s would be making a wise decision to scrap the Sandwich Rolls line altogether. I’d really only recommend these to people with a naturally strong inclination to try them; you’ll most likely be disappointed. As a final treat to all of you for making it through Totino’s week here on Review the World, I present you a special prize! I found this disturbing sight and thought it’d make a nice gift from me to you. Thanks for reading! I’ll admittedly say that of all the varieties sampled, I had the lowest expectations for this one. 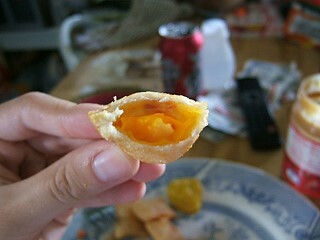 I doubted Ham & Cheese as being a viable flavor for a snack roll, I mean, a Hot Pocket, perhaps, but in this form? I thought it was too simplistic to compete with other more marketable choices, and for the most part my initial concerns were right. These weren’t bad, really, but were nowhere close to what I’d consider good either. The taste wasn’t bad, just… lacking. My Mom suggested dipping them in mustard, which was a swell idea, although not enough to technically save these from doom. 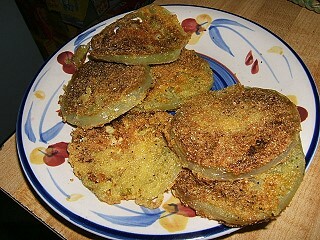 She even made her patented fried green tomatoes to increase the meal’s awesomeness quotient, and though stellar per usual, I still couldn’t get passed the roll’s inadequacies. Sure, I can see these being a good snack for Mom’s to make for kids on the move, but those with a more vested interest in their personal dining experience, I’d suggest seeking elsewhere. 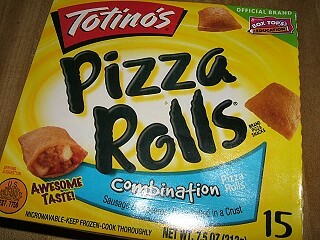 I’ll come right out and say that this is my favorite variety of Totino’s rolls. This particular flavor combines both meat and vegetables in a splendid blend of pizza paradise. What makes Supreme the supreme leader of the pack? Let’s investigate further! 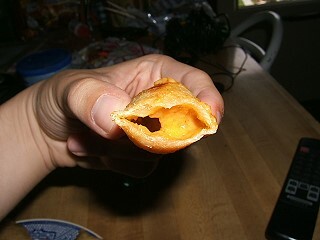 The most striking feature is, besides your usual meat additions, this snack roll contains onions, mushrooms, and peppers! The combined flavors create a unique roll, much more authentically Italian in taste. To the uninitiated, I’d place Supreme atop my recommendations, because it singularly showcases exactly what makes Totino’s Pizza Rolls so irresistible. No other variety better exemplifies how great a snack you can produce with 10 minutes and a standard oven. 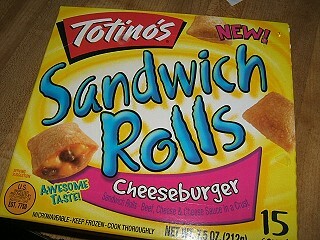 It’ll be hard for Totino’s to ever top these. Arguably the perennial Totino’s roll, Combination combines sausage and pepperoni pizza together in one flavorful hybrid. 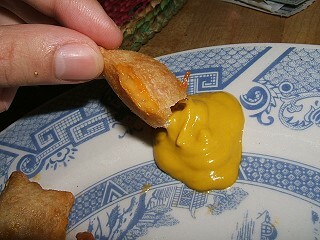 As a youth, this flavor, more so than all the others, is the one I most closely link my pizza roll memories to. As an adult, I’ve acquired tastes for the finer things in life… theatre, art, Pac-Man. Would Combination live up to its reputation? 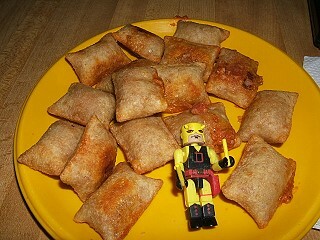 Here’s a piping hot plate of Combination rolls, and Daredevil makes a cameo to oversee the lunch lunacy. The verdict? I can’t really say that I wholeheartedly enjoyed this endeavor. Maybe nostalgia had portrayed these incorrectly, because unfortunately they didn’t meet my standards. I don’t know, perhaps I just didn’t have the appetite for them that particular morning, of maybe it was my body’s way of telling me eating Totino’s rolls twice a day for my only meals was a bad idea. 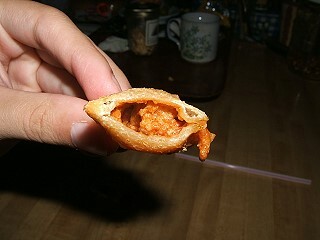 Regardless, the taste struck me as rather blasé; too many indiscriminate sausage pieces overwhelmed me. I don’t plan on abandoning all hope on Combination quite yet, though, and will return to this childhood favorite again in the future. Perhaps it’s the allure of the new Mexican Style Rolls line that has stolen my freezer burnt heart. 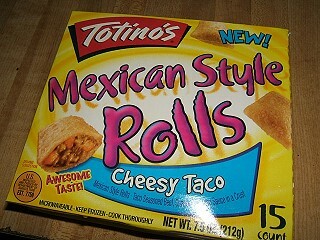 Well, after trying the Cheesy Taco flavor of the Mexican Style Rolls line, the bar has been raised pretty high. Cheesy Taco proved to be truly worthy of the Totino’s brand name, would Chicken & Cheese Quesadilla do the same? First off, I stuggled with what I believe to possibly be conceptual errors on Totino’s behalf. 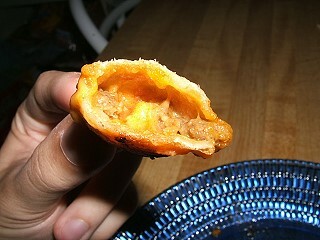 Although, surely quesdillas make mighty fine appetizers, are they suitable in roll form? Is there really even enough there to warrant a roll… just chicken and cheese, right? I wasn’t feeling too strongly about this one. Again, I was pleasantly surprised with the final result… although not as much as Cheesy Taco, these were still rather good. The ingredients were as follows: seasoned chicken, cheese, and cheese sauce. Two surprises there, at least for me, as I wasn’t expecting the chicken to have much flavor, and who’d have guessed two varieties of cheese would be making cameos? 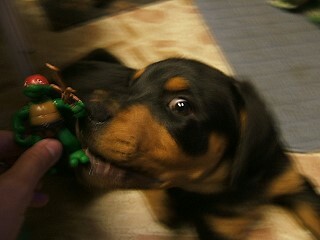 The chicken had a very good taste, and the tag team of cheese bodyslammed my tongue into succulent submission. That has to be one of the dumbest things I’ve ever said on this website. Eat these! 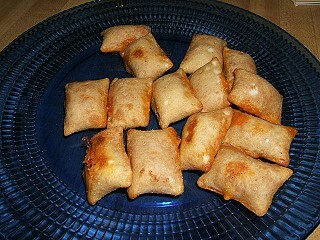 I’ve been a big fan of Totino’s Pizza Rolls for at least a decade now. Who hasn’t been? 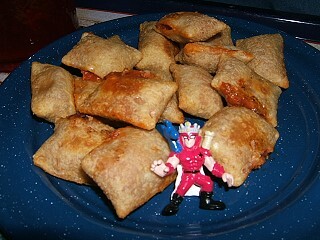 The originator of the often duplicated “pizza roll”, Totino’s has always been on top of the heap. I, too, am a huge fan of Mexican food… I just love it. 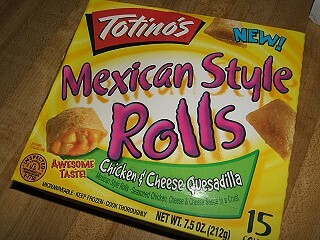 So, obviously, when I heard that Totino’s had created Mexican dining inspired rolls, my reaction was more than just enthusiastic. First off, you’re probably wondering the same thing I was, what kind of flavor is Cheesy Taco? Well, alright, most tacos are served with cheese so… I think I can accept it as a valid choice. 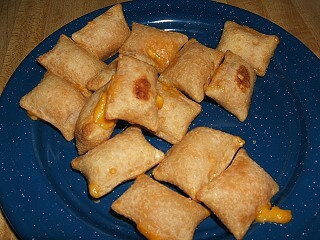 My expectations weren’t real high; unfortunately I had pegged Totino’s to fail on this attempt. I expected due to lack of flavor ingenuity, they’d just put a lot of generic taco seasoning powder in and overpower the palette. 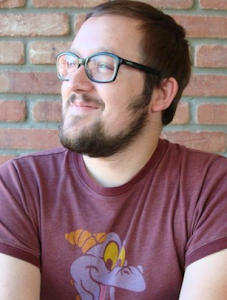 Well, I’m glad to say I was absolutely… wrong! 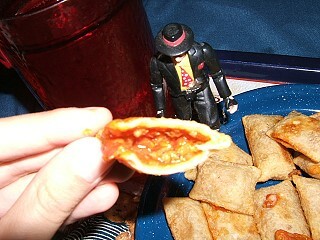 The ingredients are as follows: taco seasoned beef, cheese, and tomato sauce in a crust. The beef isn’t overly artificially flavored, and has a rather yummy taste, and the combination of the melted cheese and tomato sauce blend together perfectly. Everything mixes together well, no one particular taste is too powerful, and the overall flavor was very tasty to my liking. 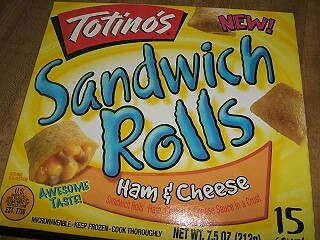 In short, these are exceptionally good, and quite possibly a new favorite in the Totino’s line.